My friend Jane Dutton died on April 17, 2014. I will miss her. Jane was Director of the Gale Free Library in my hometown, Holden, Massachusetts, before she up-and-retired early and moved to The Netherlands—of all places—for love—of all things. It took me a long time to forgive her … because it took me a long time to realize she had made the right decision rather than some colossal, adolescent blunder. My first real notice of Jane was in 1996 when she spoke at a parent event about family read-aloud at my daughter’s soon-to-be elementary school. 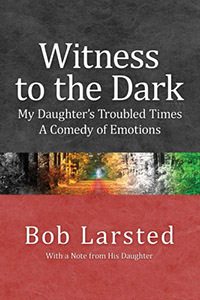 Years later, that encounter made its way into a book I was writing, Witness to the Dark , the story of that same daughter’s struggle to survive her teenage years. Reading to the children was my one true passion. We’d been doing it for years. Nearly every night. When Patricia was little, I would read her Goodnight Moon, or A Pocket for Corduroy, or The Poky Little Puppy. Over and over. Night after night. For hundreds of nights. I always assumed that once Patricia learned to read, my job would be over. Patricia was pretty smart, so I was beginning to dread the day. When Patricia was in nursery school, I went to a parent program at the local elementary school about family reading. Even though we already knew how to read, I decided to go anyway. And sit in the back. And listen. Just to make sure I hadn’t been screwing up my kid. It turns out that reading aloud to your children is OK. Good to know. I learned two more things that night: The first is that children’s literature had changed since I was a kid. I sat there and listened to our town librarian talk passionately about books. Librarians are supposed to do that; it’s their job. But what I was experiencing was more than that. This lady actually believed that books were interesting. And she gave us some examples: Hatchet, the story of another Brian’s survival despite acts of unspeakable cruelty rained down on him by Mother Nature, and Holes, a new book about digging for clues to your own history. I had to read them. The second thing I learned that night is you are allowed to continue to read to your child even after they’ve learned to read for themselves. No one does it, but it’s allowed. The next day, I went to the bookstore, snuck into the children’s section—a place where I had never been and where I thought fathers weren’t even allowed—found the books I was looking for, brought them home, went into my closet, turned on my flashlight, and read them all. They were amazing. Things had changed since I was a kid. These books were actually interesting. They talked about real problems. Real issues. Uh oh. Patricia was four. That’s when I really started on my first Quest. I spent years searching for the perfect books to read to Patricia. We started with books that were a little calmer. Books I could read to her as we got ready to read the books I really wanted her to experience. And during that time, we found lots of great books. Books for younger kids. Books that dealt with younger kid issues. Eventually, I overcame my fear of bookstore clerks. And librarians. Since then, they have been a great source for ideas on important books to read to my children. I didn’t realize until years later that, like firefighters, librarians and bookstore clerks have a passion in life: To help fathers find the next perfect book to read to their kid. Or at least the good ones do. As we read, I overcame another fear: The idea that a book, particularly a chapter book, is just too big to read aloud to a kid. It turns out that if you read nearly every night, for years, you end up reading tens of thousands of pages. That’s hundreds of books. The other thing reading did was put us together. I got to spend time—about 40 minutes each day—one on one—reading to each kid. I was never a good conversationalist, and I certainly didn’t know how to talk with children, but reading passed the time, and for a few minutes each day, at the beginning or the end of our story, we’d talk. About little things. About problems and worries. It made it so I really did know about some of the things going on in my children’s lives. And it made me accessible. I could talk to them. And they could talk to me. A few years later, and again a few years after that, as each of my children had learned to read on their own, and it remained clear that I was still nearly the only parent in town who read to his elementary-school-aged kids, I helped organize another couple of these family read-aloud events. Our guest speaker? Jane, of course. She was only too pleased to spread her message to new generations of parents. And it gave me a chance to spend time talking with Jane about something she clearly still cherished—even after her promotion from Children’s Librarian to Library Director—her love of children’s books. As my book began to make it way onto paper, as I began to read what I was writing about my own hometown, and, even worse, as I came to realize that I had managed to write more than ten thousand words without writing even one properly-punctuated sentence, I knew I needed some real help. So I walked into Jane’s office, sat myself down in her side chair, a place I’d visit many times over the next couple of years, and asked Jane if part of her job was to help budding authors in her community try to understand how to navigate a journey begun more out of need than of desire. Actually, what I really asked was, “Do librarians like you get stuck reading and commenting on every wannabe author’s great American novel?” She said yes. Jane became one of my first, actual, early readers. And because she wasn’t family or a close friend (yet), she was able to tell me what she really thought. She started by asking two questions: 1) Why are you writing this? and 2) How can you tell an honest story if you leave out your wife and other daughter? And then she made two suggestions: 1) Cut the oil-burner story in half, and 2) Lose most of the drug details. Those were the first four of a whole gaggle of my most precious darlings laid waste by Jane and her sawed-off shotgun over the next couple of years. I appreciated every one of her comments. My book improved every time I managed to take a bit of her wisdom to heart. As the book progressed, Jane helped me answer some of those questions. And she helped me find the balance between writing the book I needed to write, writing the book I was willing to write, and writing the book that my intended audience would find some solace in. For some reason, she let me get away with my self-invented grammar without a fight, and, as the book got longer and longer and kept referring back to that oil-burner story in more and different ways, she let me get away with cutting it by only a quarter, provided, of course, that I trimmed the rest of the book by that same amount. Jane’s exit from Holden came as a big surprise to me and to others in town. She had become such an important pillar in our community we didn’t know what we would do without her. But a strange thing happened: as she moved away physically, she grew closer by way of her occasional emails and her more-regular, new blog. And we all managed to find ways to survive with and without her in new ways. Over time, it became clear that Jane had found true happiness in her new family, something that could only have come by taking a tremendous risk. I hope they found that same connection with her, and if the smiles in the Facebook postings are any indication, it seems they did. On March 16, 2013, barely two months after my book was published, I got an email from Jane saying that she had written a blog mentioning my book and hoped it was OK because she was posting it later that day. OK? Jane’s blog was famous. Of course it was OK. (But only if she had something nice to say?) I spent several time zones holding my breath waiting for her to press the go button. Ultimately, I was so pleased with her comments that I asked if I could quote her. Months later, at an author talk, someone looked at Jane’s quote—right up there next to the Kirkus review on my little display stand—and said, “Is that by the famous Jane Dutton?” Of course it was. How could there be more than one famous Jane Dutton? This entry was posted in Book and tagged book, friend, jane dutton, librarian. Bookmark the permalink.